Spring has arrived in South Africa. We hope that this year the rains will arrive with the summer months that lie ahead, and that we can leave the drought behind us. One thing that we can be certain of is that when the rains do arrive the weeds will soon follow. The weeds, our number one enemy, will be ready and waiting to emerge stronger than ever. As farmers we need to think ahead and be ready for this occurrence with a plan of action to combat our enemy, the weed. In this article I will outline the importance of controlling weeds before they have emerged and before they are growing in full force. 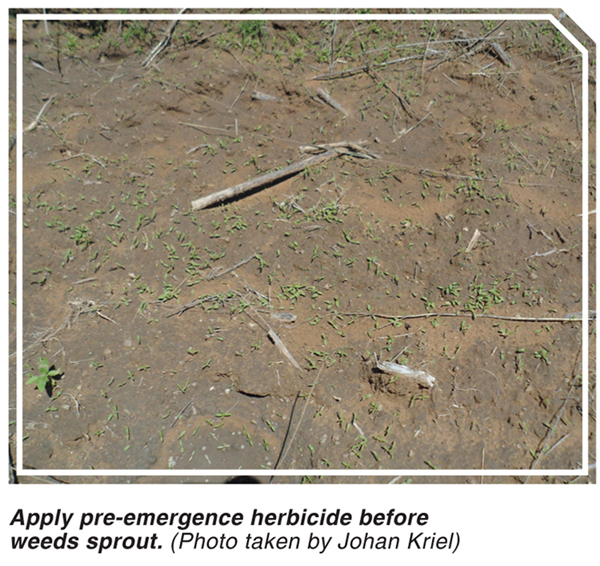 What is a pre-emergent herbicide? A pre-emergent herbicide is chemical which is applied to a field by using a tractor drawn spray rig or an aeroplane crop sprayer. The purpose of the pre-emergent chemical is to inhibit the germination and emergence of weeds which are dormant and are yet to sprout. They do this by disturbing enzymatic processes in the weeds biological germination period. If the weeds do not germinate they will not be able to absorb sunlight and therefore will be unable to grow. Your first step in planning a spraying program is to decide what crop you will plant where. Remember that every crop is different and needs to be treated differently. Before the planting season one should consult a chemical representative who is knowledgeable on the different herbicides available on the market. They will explain the different functions of the chemicals and the best methods of application. Different herbicides control different weeds which is why for each different crop that we plan to plant we should create a unique spraying program. Some chemicals are specifically developed to control broad leaved weeds, some are specifically developed to control grasses and some are developed to control a mixture of broad leaves and grasses. Therefore, it is extremely IMPORTANT to know which weeds the chemicals that you purchased are designed to kill. If we plan to plant sunflowers we cannot use a pre-emergent herbicide which controls broad leaves as our sunflowers will also not emerge. 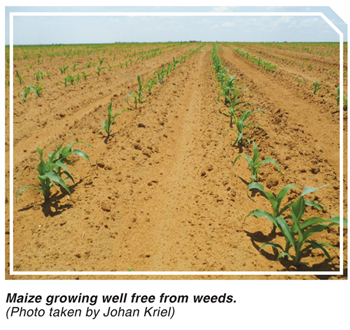 Alternatively, if we plan to plant maize we cannot use a pre-emergent herbicide which is designed to control grasses. There are however certain exceptions when it comes to the use of genetically modified seeds. Some cultivars have been developed to withstand certain strains of chemicals in order to improve weed control. This is why it is extremely important to consult with experts in the field of seed and chemicals before deciding what to plant and what to spray on the crop that you plant. When spraying pre-emergent herbicides, it is important to apply the chemical before the weeds have germinated, as timing is everything when it comes to the efficacy of this form of weed control. It is also crucial that the climatic conditions are conducive in aiding absorption of the chemicals. When is the correct time and what climatic conditions are favourable? 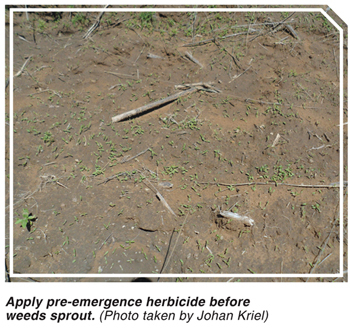 The timing of applying pre-emergent herbicide depends on the tillage practices which you employ on your farm. If you practice conventional tillage, then you will apply your herbicide soon after the lands have been cultivated, so that the weed seeds do not get a chance to germinate. When using no-tillage practices one would first spray the field with a ‘burn-down’ herbicide application. This will kill all weeds that have emerged. One should then follow up with a pre-emergent herbicide which will inhibit any more weeds from germinating. For both of these practices one should try to perform the spraying when there is slight drizzle or damp weather conditions, as this will help the chemicals to absorb and fix into the soil where the dormant weed seeds are lying, therefore allowing for the best results. With weeds as our number one enemy, we need to do all that we can to control them during the growing season. Without controlling weeds, we put ourselves at risk of lower yields and further exacerbating the weed problem in our fields by filling the seed ‘bank’ in our soil. 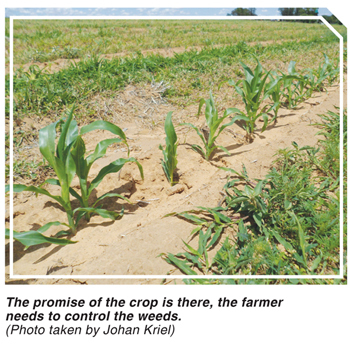 Preemergent herbicides are just one of the tools at our disposal in the war against weeds. For more information, send an email to gavmat@gmail.com.